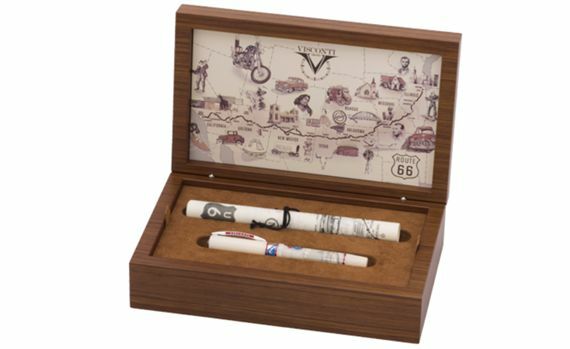 Order your Visconti Limited Edition Route 66 Fountain Pen today from FahrneysPens.com. Fine Pens, Refills & Luxurious Gifts – great prices & fast shipping. Visconti’s Route 66 marks the 90th anniversary of the opening of U.S. Route 66, or The Mother Road, in 1926. The highway became one of the most famous roads in America, originally running from Chicago to California, covering a total of 2,448 miles. 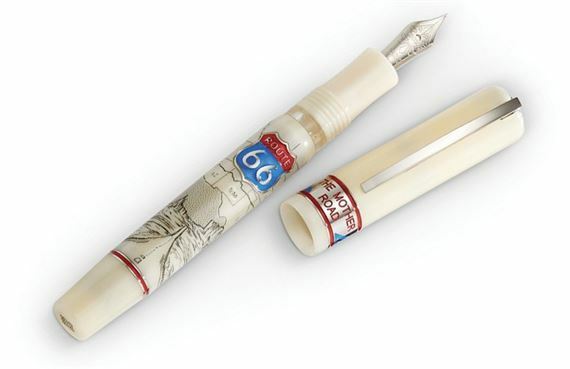 The Route 66 is crafted in scrimshaw with enameled, sterling silver accents. Collector’s box is solid American walnut. The fountain pen has a flexible 23K palladium nib and double reservoir power filler. Limited to 366 pieces. Bottle fill only.